Whilst motorbike accident solicitors are often critical of a motorist who fails to appreciate that a motorcyclist has just as much a right to be on the road than the motoring counter-part there are times when a motorcyclist does act recklessly or carelessly. The case for this example is a dangerous manoeuvre where thee motorcyclist overtakes a car on a bend. This is in breach of the Highway Code, not just for motorcyclists but also for motorists. In fact this manoeuvre is similar to the example where the motorbike rider swerves to avoid a motorist who crosses a lane divider. In this scenario the motorcyclist will be deemed to be negligent. If the motorists is injured as a result of the motorcyclist’s actions, then the motorist will have a claim for compensation. 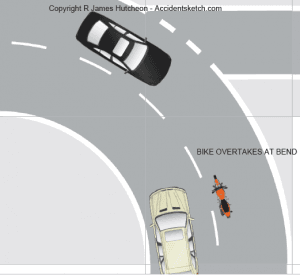 The motorcyclist in this example would 100% be at fault in our view.